One of the many ways we personalize our layouts is how we name things – towns, stations, industries, etc. Yes, we can use the names or labels that come with structure kits, but few of us do that all the time. So, usually, there is a story behind the names that we do choose. Sometimes we pick a name that is funny (even if only to ourselves); sometimes we pick a name that is meaningful. In the 1970s and 1980s, while trying to develop a stock photo library that, among other things, offered clients a wide range of photos related to railroads, I was also very much interested in what others were doing in the way of railroad photography, particularly in such magazines as Trains and Railway Age. One person stood out among the rest — to the point that I could usually identify his work, before I even read the credit line on the photos — Richard Dean Steinheimer (1929-2011). I cannot say that I knew Richard Steinheimer well, other than through studying his work. Yet, he had and continues to have a profound effect on my photography, my writing, and me. In early 1990, at the age of 43, I paid several hundred dollars (plus more in travel expenses) for a two-and-a-half day one-on-one workshop with Steinheimer. It was some of the most worthwhile money I have ever spent. I had seen his work in books and magazines. He was doing some of what I was trying to do with my photos and writing—and doing it far better. I had read that Steinheimer occasionally did small-group or one-on-one workshops. I knew that he was almost 20 years my senior, and might not be doing these much longer. So, I tracked down his address and wrote him. We exchanged letters. I sent samples of my work, and we agreed on a time and location for the “workshop.” The reason I put workshop in quotes is that it may not fit how you would think of a photo workshop. The workshop began one evening with a slide show at his home in Sacramento. Not your average kind of slide show, either. It was a two-projector program with a narrated and musically-accompanied sound track that skillfully blended Steinheimer’s and his wife’s (his wife Shirley Burman is also a professional photographer, specializing in audio-visual presentations) photos with historical photos from some of the same locations. No, he hadn’t put that program together just for me. My workshop fee wouldn’t have begun to cover that. The program did, however, give us a starting point for the discussions that began that evening and ranged over the next two days. What became obvious was that to produce those photos Steinheimer had to put many miles on his van, and to be at the locations at first light of day, he had spent many nights in his van. 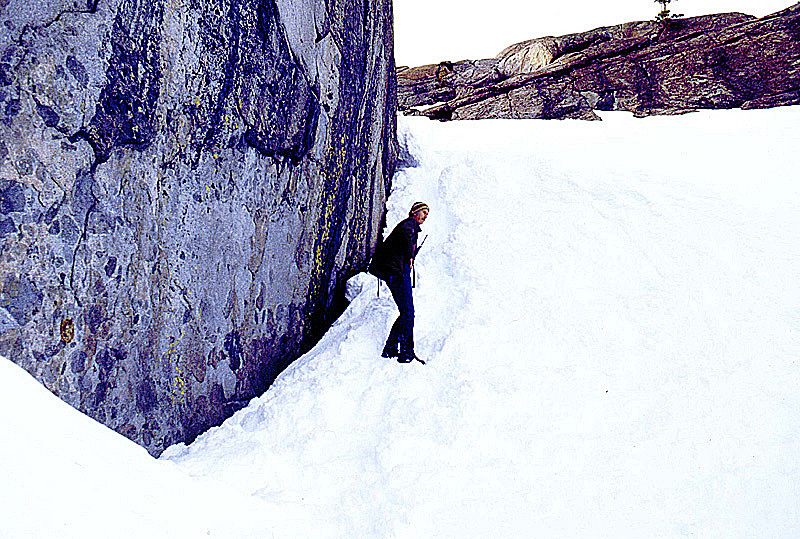 Early the next morning Steinheimer picked me up at my motel, and in his well-traveled van, we headed east up into snow-covered Donner Pass in the high Sierra Nevada. Donner Pass had been the subject of one of Steinheimer’s books, Diesels over Donner, which I owned and which had led to my choice of location for the workshop. And, so, for the next two days, we rode in his van; we hiked, sometimes on snowshoes; and we made photographs. But, mostly we talked—about photography, but other subjects, too. We talked about how words and pictures complemented each other, and how the total was often more than the sum of the parts. Steinheimer was an invaluable guide in terrain where, even with USGS topo maps, I would have needed a long time to find photo locations. But Steinheimer provided guidance in another way, too, as I watched him work. He carried a simple kit of equipment in a moderate-sized waist pack. My own gear far outweighed his and he frequently made gentle fun of my “killer bag” as we made our way through the snow drifts—but he also imparted something that I’ve thought about often. Thinking about photography that way gives you a little more incentive to apply yourself as you make each and every photo—to try a little harder to make that photo as good as it can be, to try techniques you’ve never tried before, or to take a different approach to a familiar subject. After all, you’re not just making that particular photograph. You are adding to your life-long body of photographic work. Most readers of this magazine have seen Steinheimer’s photography. Few may appreciate how well Steinheimer was able to write to help put his pictures into context, or how curious he was about almost any subject imaginable. Even fewer probably understand what a kind and generous person Steinheimer was. The workshop fee didn’t begin to cover three days of his time. During the workshop, Steinheimer ended up paying more than half our expenses, And his generosity went far beyond money. Southern Pacific employees were truly happy to see him and there were few who did not know who he was. While we were on Donner, SP—Donner was still an SP domain back then—was running a test train repeatedly up and down the hill. The loaded coal train would attack the grades with various distributions of engines and horsepower. We both laughed when Steinheimer commented that, when the smoke came out of the tunnel before the train appeared, that was not a good sign. But, when we encountered the train later at another location, the crew—including some top-level managers—stopped and got off to talk to Steinheimer. Steinheimer, in turn, lined up the crew for a group shot in front of the lead engine. During the workshop, Steinheimer never told me that I should or shouldn’t do something. Rather, there was a long series of gentle suggestions for locations, angles, and techniques. After the workshop, we only corresponded briefly. I saw the workshop as mostly a business transaction, and that, with his great generosity during the workshop, he certainly owned me nothing further. And, living on the opposite side of the country, I never had a chance for another encounter. What Steinheimer meant to me—and continues to mean to me—can best be illustrated with an anecdote. For a time, my late father traveled extensively for his work for the U.S. government, taking multiple flights each month. My father was also a great admirer of then CBS news anchor Walter Cronkite. During one of those flights, my father actually ended up sitting next to Cronkite on a plane. When, on returning home, he reported that fact, I asked him what he had said to Cronkite. “How are you, sir,” he reported. How sad, I thought. What a wasted opportunity. I’m glad that when I twice met Charles Kuralt, also then a major TV figure and someone who, like me, had attended the University of North Carolina and worked on its student newspaper, I had a chance to talk to him at some length. And, I’m glad that I had those two days of conversations with Steinheimer and that I’m the proud owner of several Steinheimer originals—slides of me that he sent me after the workshop. I look somewhat silly tromping along on snowshoes with my big photo bag, but that’s all right. On our way back to on Sacramento the final day, we detoured via Portola to get a quick look at Union Pacific’s Feather River Canyon route as the light of day faded. As he drove westward along California highway 70, he pointed into the roadside darkness and indicated that Keddie Wye was just below. That alone was enough to bring me back several years later to produce some photos later published in multiple venues. That’s what Steinheimer provided for many of us—a guide who went on ahead and urged us to keep up with him. 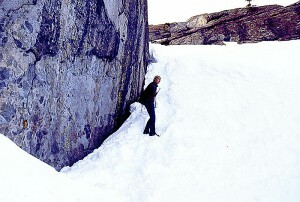 Steinheimer clambering up a snow-covered Donner Pass slope ahead of me in 1990, looking back to see what was keeping me. The editors at Trains (which had published a number of my photos and articles previously) liked the piece. Unfortunately, though the magazine, which had published hundreds of Steinheimer’s photos and articles in the past and which devoted a substantial part of one 2011 issue to a tribute, just didn’t have the space for my piece. There were many far more prominent people, some of whom had known Steinheimer well over many years, who offered tributes. Without bothering to bore you with all the economics and realities of freelance journalism, it’s important to note that a time-sensitive personal essay is one of the most difficult pieces to place with a magazine. If you’ve worked previously with an editor at a publication, you can usually get at least a tentative expression of interest for most feature articles based on a brief proposal. Sometimes that proposal turns into a firm assignment before the actual feature is ever written. But, with a personal essay, you generally cannot condense what you are trying to say into a brief proposal. So, the article has to be written, before you ever try to place it. And, for a time-sensitive essay, there is only a brief window of time in which you may have the essay accepted. If the original publication waits too long to turn down the piece, time has generally run out for placing the piece with another publication. Stein is the German word for stone. Long ago, I had acquired and built an HO Pola kit based on the original appearance of the Austrian station of Flirsch on the Arlberg line in far western Austria. That station had a stone exterior, not uncommon for some Austrian mountain buildings of its time. Yes, among the conversations I had with Steinheimer was a discussion about photographing scale models and how to light these scenes. Though he was not an avid model railroader himself, before going freelance, Steinheimer had worked as a photographer for Ford Aerospace, where his job included photographing scale models of various projects of that company. And, yes, I still think about some of those discussions each time I make a more than casual attempt to photograph a scale model. And, there are actually several more similar stone structures intended for Stein am Berg, some of which were quite extensively modified. So, until next time…. I enjoyed your tale once again, Ernest. “Stein am Berg” is also a good description of your photo above!